This Saturday (16/07) Austria’s most modern and largest stadium since Euro 2008 will see its official opening. 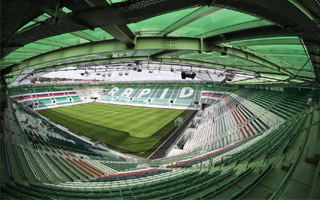 Rapid Wien will face Chelsea, who in recent years are almost specialized in inaugurating new stadia (like Groupama Arena or US Bank Stadium). The friendly game is sold out and will be one of three major fixtures in upcoming days. The Austrian Bundesliga inauguration follows on July 23, against SV Ried. And the week afterwards, the Viennese club will begin the Europa League campaign. All this within just several days, promising a very exciting summer for Rapid supporters. But you may also consider the Saturday Chelsea friendly already the third event because this past weekend two partial openings took place. Second event took place on Sunday, when the business club welcomed its first guests. Spreading across two floors, the most exclusive areas of the stadium offer, among other rooms, 41 private boxes. According to Sunday release by SK Rapid, the business zone of Allianz Stadion is approximately 80% occupied before the upcoming season. All indications say that from the upcoming Chelsea game Allianz Stadion will become and remain Austria’s most attended football venue. The club expect well in excess of 15,000 people per game, which would be unmatched domestically. Construction of Allianz Stadion is now officially over, it was handed over by main contractor Strabag last week. It took €53 million and 17 months to complete, which is an impressive time frame for a stadium able to hold 28,600 people!